I have a new kayak and know that at some point will get and install an anchor trolley, Just want to wait a while before I drill or attach anything to my yak. In preperation I have been looking on the net about anchor trolleys and quick releases.I currently have part of a pool noodle with line tied from it to a weight that I use as my anchor. I can quickly throw the noodle over if needed or add a half hitch around noodle at desired location. Noodle goes right under my foot peg making it easy to keep noodle from being pulled out if need be. Want to keep a float on end of anchor line and have the ability to change the length of the anchor line let out. Was thinking could feed the anchor line out to desired length then a little further up the anchor line double the line. Pass the doubled line through the trolley ring and secure side going to the anchor. Could unsecure and let more line out or shorten it. 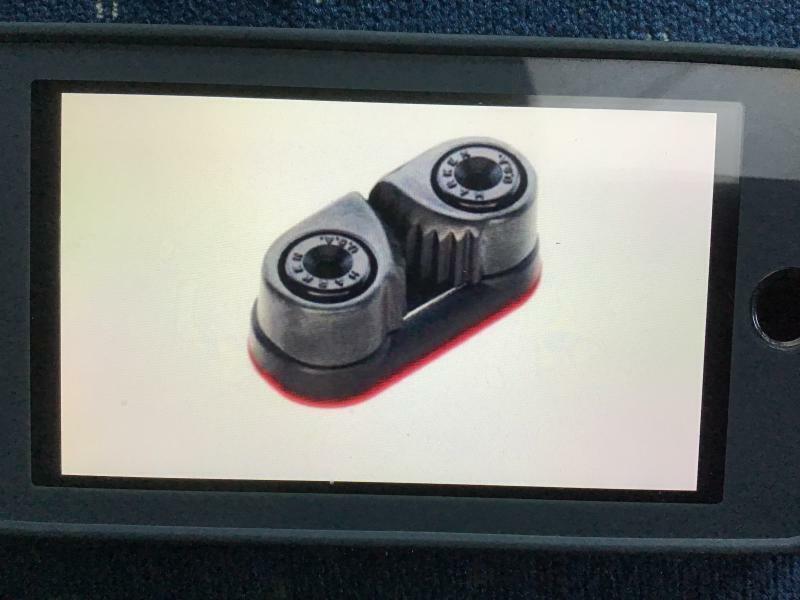 For quick release just unsecure and release the doubled line letting it go through the trolley ring which would pull the rest of line and float in. Only the short section of doubled line would have to go through the trolley ring so a lot less chance of tangling and not going through than if was using a line with nothing on end. Seems like this would work and require no additional materials. I also thought about using floating line and doing away with the float but believe that at night or if decide to go a little further from where left anchor(ie. go chase down jugs then come back) it would be much harder to see the floating line than a float. Don't do away with the float. After tinkering with multiple set ups (cord holder, retractable clothesline, pool noodle); this is what has worked best for me. I'll try to find a video of a similar design showing someone running the dropped anchor line through the free carabiner. For salt fishing, I'd recommend using a Bruce Claw anchor with a quick release system (no carabiner to anchor) Mushroom anchors are fine for the mostly clay/grassy bottom lakes of north east Texas. Similar design using PVC--video shows wrapping the anchor line in the free carabiner. It is hard to tell but believe that at "attach to anchor trolley" this is a caribiner or a caribiner is attached to it and anchor trolley ring. If so, your quick release is to undo this caribiner? Go to this video, fast forward to close to 2 minutes . . . and you can see a very good method of anchoring using the device he (Ty) cobbles together. And, he shows how the attachments are used, deployed. Brad, Thanks for the video link. Caribiner is the quick release. 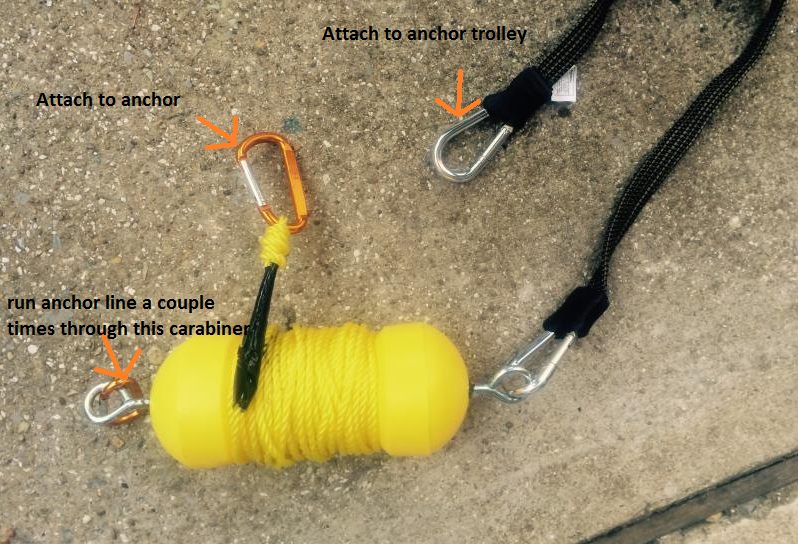 Anchor trolley could get twisted,jammed or ring pulled under boat so could not get to ring to detach anchor. If heavy pull on anchor, may be difficult to undo caribiner from anchor ring. This is what I use for a quick attach & release. easy reach of either hand, especially if you turtle. I've never been good, But I've been Lucky! I don't Lie or Exaggerate, but sometimes I remember BIG! Yes, that's a leash with caribiners at both ends (found at Wmart in the camping section). Quick release that caribiner from the trolley. The float keeps everything you need above the water line to go back and get it. Yes, I am thinking about this or a track mounted cleat to put the anchor line in. And always having access to a sharp knife is a given. This is a subject close to my heart. Get ready for sensory overload.